The Kaiser Wilhelm Memorial Church (in German: Kaiser-Wilhelm-Gedächtniskirche, or just ‘Gedächtniskirche’) is one of West-Berlin’s iconic sights. It was badly damaged during the last days of the Second World War – basically only the bell tower remained more or less intact. Today the church consists of two parts – or actually of three buildings. Next to the old church you can see the ‘new’ church building and the new bell tower, designed by architect Egon Eiermann in the late 1950ies. 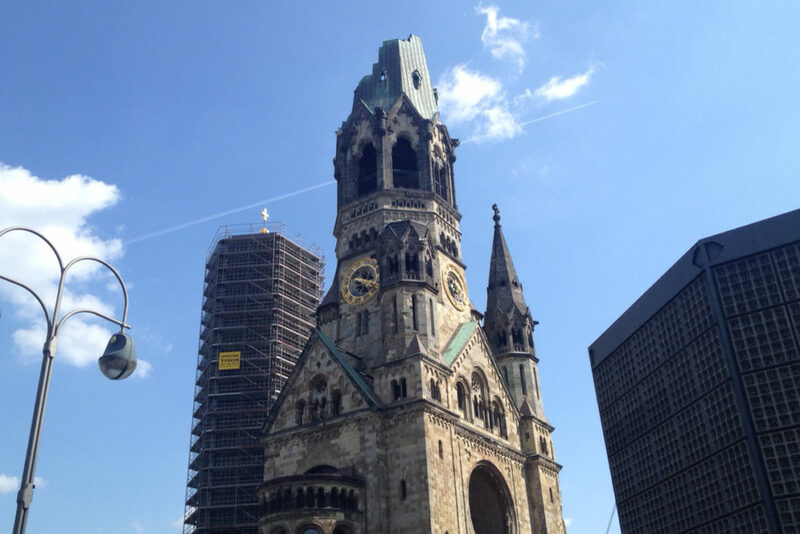 The church is located in West-Berlin’s area Charlottenburg – near Zoo train station (Bahnhof Zoo), Kurfürstendamm (Ku’damm) and Europa Center – basically in the centre of the Breitscheidplatz. The easiest is probably to take either U-Bahn or S-Bahn to Zoo station. Alternatively you could either take one of the many buses, or take the U1 and get off at station Kurfürstendamm.